Hello! 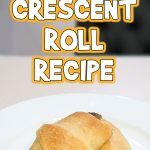 I’m back with another easy recipe for you. 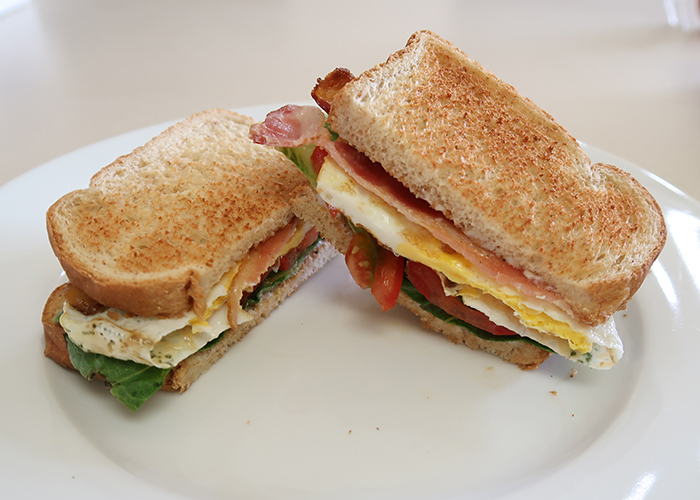 Today we’re going to make these Egg BLT Breakfast Sandwiches. 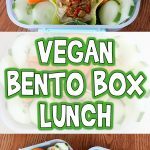 These are a huge hit with all of my kids, and filling enough to be a meal on their own. Let’s get started! Start by preheating your oven to 400?F. 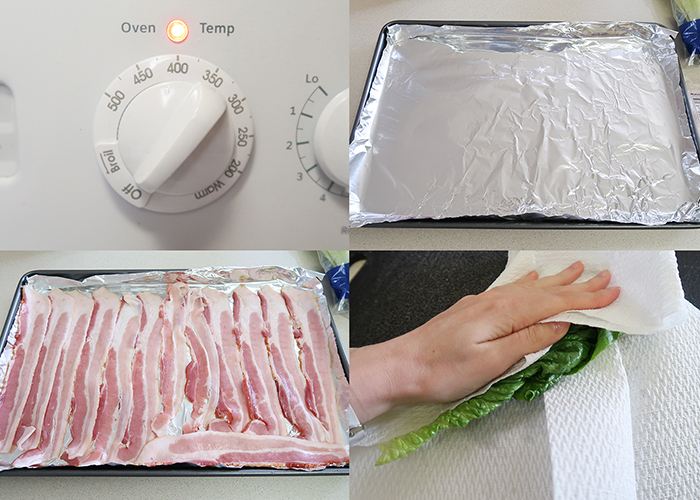 Line a baking sheet with aluminum foil, and spread your bacon out on the foil. Pop it in the oven to cook according to package directions, about 10-15 minutes depending on how crispy you like you bacon. Alternatively, you can also pan fry your bacon. I just like doing it in the oven when I’m cooking for everyone. 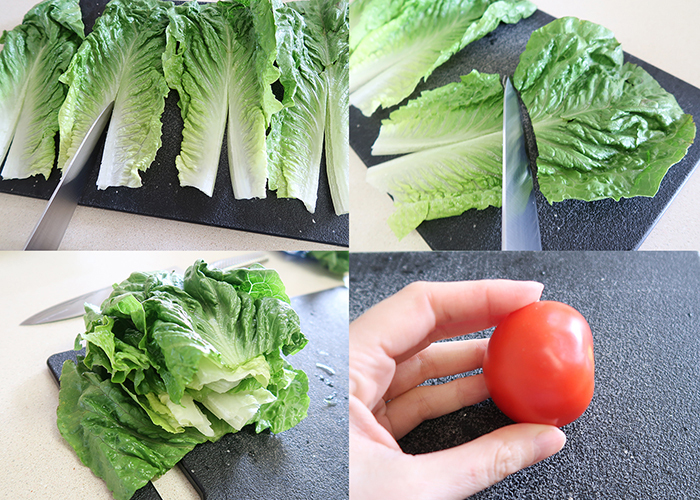 Take your lettuce and rinse it throughly, then dry it off. If you’re using romaine, make sure to slice down the center of the crunchy part, and cut the leaves in half so they’re bread sized. Rinse off your tomatoes as well. And slice them up. Go ahead and start toasting your bread. 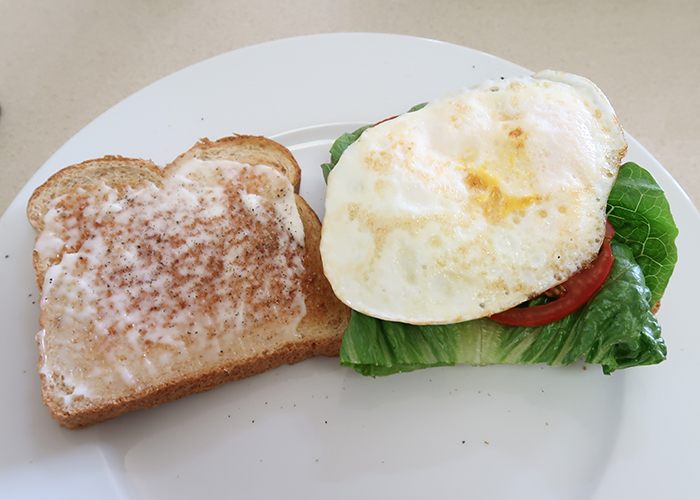 Spread a thin layer of mayonnaise on both slices of bread, and sprinkle with salt and pepper to taste. By now your bacon should be done, so take it out of the oven and let it drain on some paper towels. 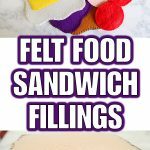 Start assembling your sandwich. Layer on the lettuce and tomato. Now let’s make an egg. Spray a non stick cooking pan with non stick spray or use a small amount of butter or cooking oil. 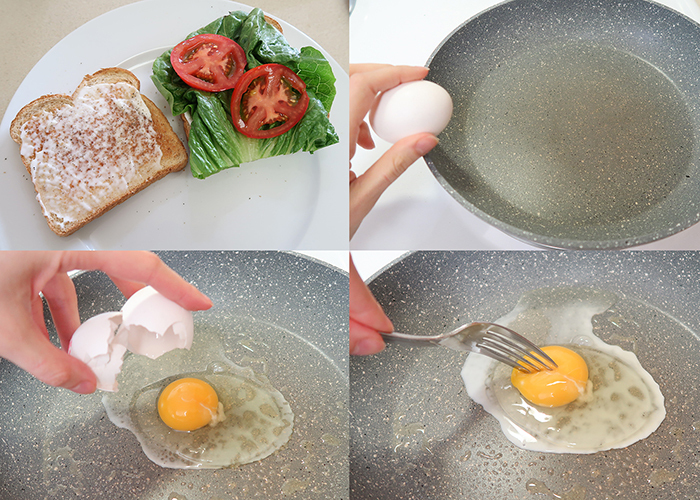 Crack an egg into the pan, then break the yolk with a fork. Go ahead and cook the egg until it’s over hard, and lightly fried on either side. 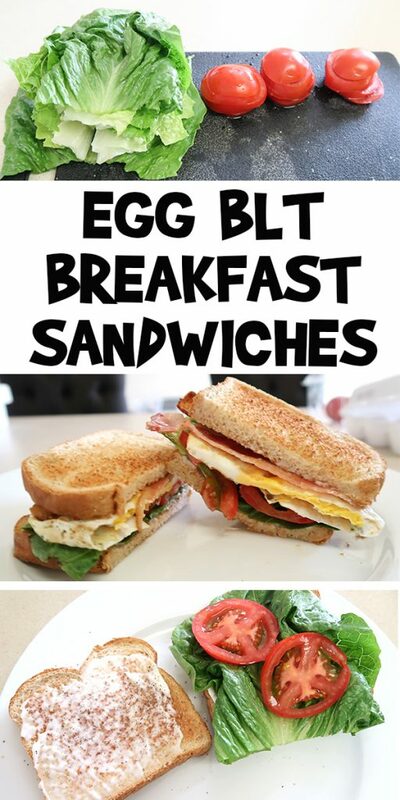 Then slide your egg onto your sandwich. Top it with as much bacon as you’d like. 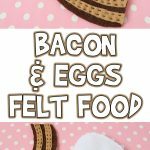 This is one of my favorite breakfast and lunch foods to make, as it’s a fully balanced meal in a sandwich. Plus, everyone loves it and it’s a great meal for a beginning cook to make. Hello! 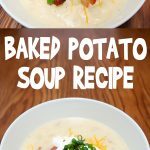 I'm back with another easy recipe for you. 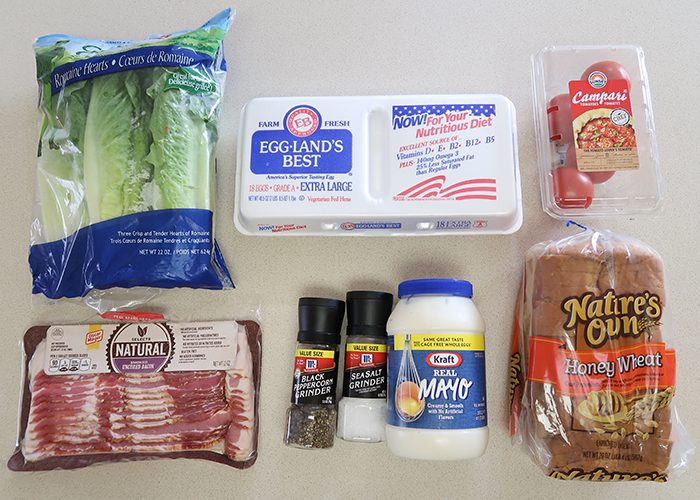 Today we're going to make these Egg BLT Breakfast Sandwiches. 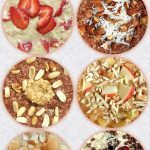 These are a huge hit with all of my kids, and filling enough to be a meal on their own. Start by preheating your oven to 400?F. 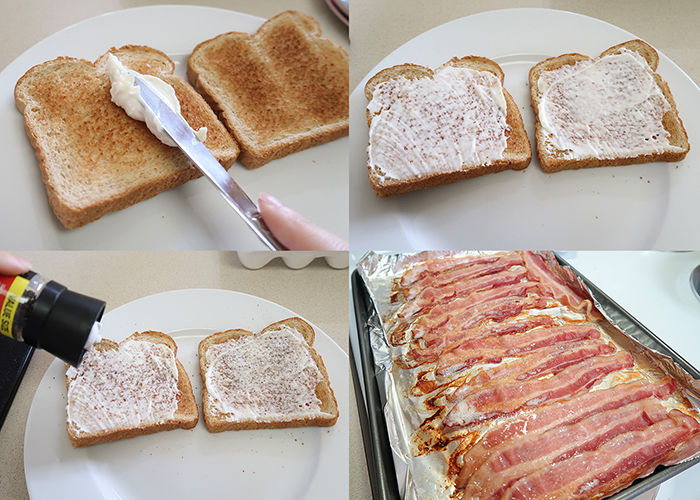 Line a baking sheet with aluminum foil, and spread your bacon out on the foil. Pop it in the oven to cook according to package directions, about 10-15 minutes depending on how crispy you like you bacon. Alternatively, you can also pan fry your bacon. I just like doing it in the oven when I'm cooking for everyone. Take your lettuce and rinse it throughly, then dry it off. If you're using romaine, make sure to slice down the center of the crunchy part, and cut the leaves in half so they're bread sized. Rinse off your tomatoes as well and slice them up. Toast your bread if you'd like. Spread a thin layer of mayonnaise on both slices of bread, and sprinkle with salt and pepper to taste. By now your bacon should be done, so take it out of the oven and let it drain on some paper towels. Now let's make an egg. Spray a non stick cooking pan with non stick spray or use a small amount of butter or cooking oil. Crack an egg into the pan, then break the yolk with a fork. Go ahead and cook the egg until it's over hard, and lightly fried on either side. 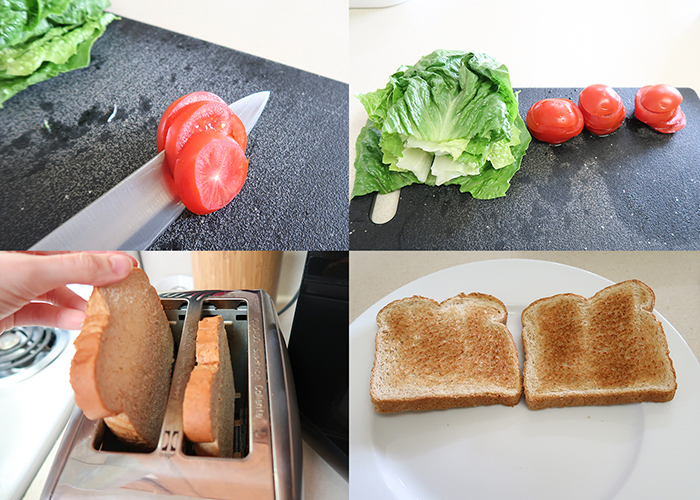 Start assembling your sandwich. 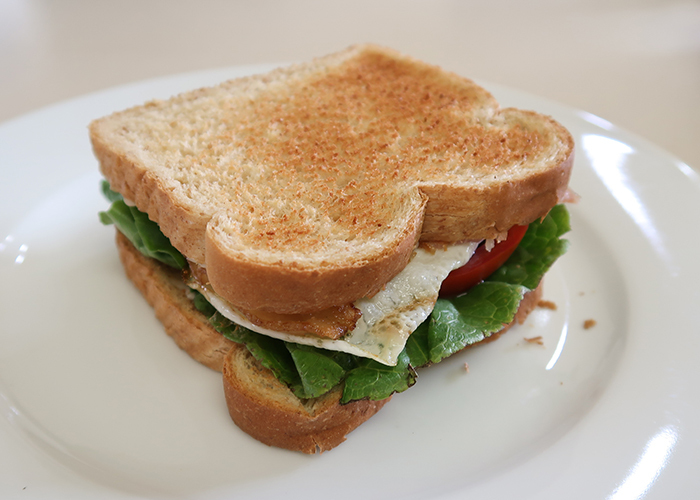 Put on your lettuce and tomato, then slide your egg on top. Top it with as much bacon as you'd like, and put your second piece of toast on top.